A basic recreational swimming wetsuit will help keep the chill off in the ocean or for when you’re playing around in the pool. For general purpose water play, consider an entry level wetsuit made of Standard Neoprene -or- 30% Stretch Neoprene. If you are swimming laps occasionally, a stretchier suit will be less restricting. Look for a 30-60-or 100% stretch suit depending on your budget. Basically, the stretchier the better! If you are serious about lap swimming, you should instead consider a triathlon wetsuit. Check out our selection of triathlon wetsuits. Depending on water temperature, you might need a full body wetsuit (fullsuit), a springsuit, or a top or bottom. Learn about wetsuit thickness below! And, here’s some information on seam types! Is awetsuit used as a lifeguard? Will I float? To answer your first question, no, wetsuits are not to be used as lifesaving devices – they are not made to be used as a means for flotation. Wetsuits will not provide any significant buoyancy. We do have wetsuit bottoms, but we don’t have a wetsuit that has capri length legs. Here is a link to some wetsuit bottoms but if you are diving, we might want to consider a full wetsuit for UV and abrasion protection: https://www.wetsuitwearhouse.com/search.html#/?_=1&filter.gender=Men%27s&page=1&filter.suit_type=Pants&filter.suit_type=Shorts. If you need additional help please feel free to reach out to our customer service team either via phone, 866-906-7848, or email, service@wetsuitwearhouse.com. Thank you! which wetsuits do you recommend suitable for a) SWIMMING laps in home pool (not competition) b) keeping warm in 60F c) easy on-off d) size 3XL? Even if for recreational use, a triathlon suit is still the best option for a wetsuit used for swimming. At those water temps, either a long john or fullsuit would work well. Here’s our selection: https://www.wetsuitwearhouse.com/wetsuits/category/triathlon-wetsuits.html#/filter:suit_type:Fullsuits/filter:suit_type:Long$2520Johns. Thank you! I need help getting a wetsuit I need stretchy and easy to pul on you see I have had fibromyalgia for over 30 year and swimming is the best I can do for me but my pool is cold in the winter and can not afford to heat it. I need full body with flexibility and at a good price the illness has made me stop working disable. The best type of suit for swimming, even if recreational, would be a triathlon suit. A fullsuit will take you down to water around 60F. If you want something with a front zipper, take a look at this Henderson suit: https://www.wetsuitwearhouse.com/PROD/AP830WF.html. It won’t be as good for swimming but will be easy to get on and off. We are located in Maryland, at currently do not have any locations on the west coast. However, we do have an easy return/exchange policy, which you can find here: https://www.wetsuitwearhouse.com/returns-exchanges.html. If you need additional help, please feel free to reach out to our customer service team either via live chat, email (service@wetsuitwearhouse.com) or call at 866-906-7848. Thank you! Thanks for asking! With the heated indoor pool being those water temps, we recommend a 3mm shorty springsuit. Check this one out: https://www.wetsuitwearhouse.com/PROD/S630MB.html. If you’re worried a 3mm may be too hot (these are good for water temps 66 degrees Fahrenheit and up), you could also look into a 2mm shorty springsuit like this one: https://www.wetsuitwearhouse.com/PROD/S620MB.html. Thank you and hope that helps you! I would recommend either a long jane triathlon wetsuit or a full triathlon wetsuit. They are both great at preventing drag. The long jane works in 50 degree and up temps. Here are two great options: https://www.wetsuitwearhouse.com/wetsuits/category/womens-triathlon-wetsuits.html#/filter:suit_type:Long$2520Johns. OR if you think that you’ll need full arm and leg coverage, check out our full wetsuits (however, they may be too warm in a 70 degree heated pool): https://www.wetsuitwearhouse.com/wetsuits/category/womens-triathlon-wetsuits.html#/filter:suit_type:Fullsuits. Thanks for reaching out and asking! I live in Washington State, and I am wanting to get into free diving. Water temps around here are usually 40-45 and I don’t know much about wet suits. I would really appeciate if you could help me out!! Any dive suit should work well for you. However, with those water temps, I’d recommend checking out this 8/7mm Men’s Henderson Thermoprene Pro Hooded Fullsuit: https://www.wetsuitwearhouse.com/PROD/AP887MF.html. This will keep you nice and warm in those water temps plus it has an attached hood and you don’t have to fuss with buying a fullsuit plus a wetsuit cap. This suit is stretchy and designed for diving. 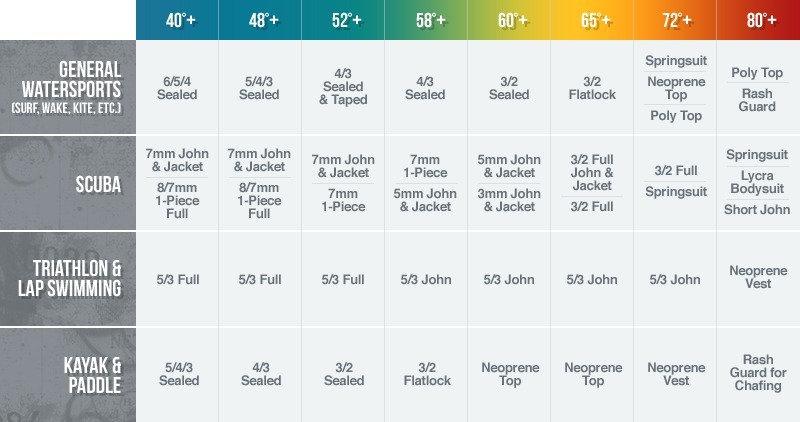 However, if you think 8/7mm is too thick, check out our selection of 7mm diving fullsuits: https://www.wetsuitwearhouse.com/wetsuits/category/mens-scuba-7mm.html. Keep in mind too that you’ll probably need a wetsuit cap (you can find our selection here: https://www.wetsuitwearhouse.com/wetsuits/category/wetsuit-hoods.html) and possibly gloves as well (find those here: https://www.wetsuitwearhouse.com/wetsuits/category/wetsuit-gloves.html). If you still need help figuring out what exactly to get, feel free to contact our customer service team either via live chat, email (service@wetsuitwearhouse.com) or call 866-906-7848. Thank you!